Wondering if Silicone Breast implants are right for you? With all of the previous controversy of the "old" silicone implants and recent FDA approval of the new cohesive silicone gel implants, we will help put your mind at ease and make the best decision for yourself. Silicone Cohesive Gel Breast Implants were approved by the U.S. FDA in November of 2006 for general use in women ages 22 and older for breast augmentation as well as reconstruction. Kansas City Plastic Surgeon Dr. Chhatre has been using the Natrelle® Gel Silicone Implants with great success and beautiful results. The first four generations of the silicone gel breast implants were inferior with a very thin low-cohesive gel in a very thin shell. These implants showed an increase risk of shell rupture as well as silicone gel bleed through and intact shell. These risks often would result in capsular contracture where the body would try to protect itself from the foreign object, with the end result being very hard and painful. Unlike the new cohesive gel that stays in form the older generation silicone implants would spill if cut with scissors. Each generation of the silicone implant greatly improved from the one before when in the mid 1990's the thicker cohesive gel changed the industry. 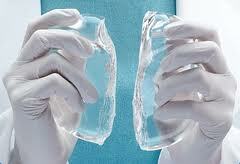 The 5th and current generation of the silicone gel breast implants have evolved tremendously over the past 20 years. Natrelle® silicone gel breast implants have an advanced technology and enhanced safety profile thanks to several changes in product design and manufacturing. The cohesive gel is a firmer yet softer solid when cut in half there is no movement of the gel and the shape of the implant remains intact. Studies show low reports on capsular contracture as well as rupture. The safety of Natrelle® silicone gel-filled breast implants meet one of the most rigorous standards of all medical devices. There are studies that show a very low rupture rate over an 11 year period with around 92% of implants still intact. Kansas City Plastic Surgeon, Dr. Matt Chhatre has been done a large number of breast augmentation with silicone implants with great success. Our patients at Summit Plastic Surgery & MedSpa have been extremely happy with the look and natural feel of their silicone breast implants. If you are interested in learning more about Silicone gel implants or have any additional questions contact our office today for a consultation with Dr. Chhatre.